Since its debut in 2006, the TRX Cymbal Company has been dedicated to creating high-quality cymbals that meet the needs of today’s progressive drummers. TRX’s original DRK, MDM and BRT series offered the first multi-series system for achieving tonal consistency and contrast across an extended spectrum. Over the years TRX’s innovative cymbal designs— LTD Crash-Rides and Chinas, high-powered, high-frequency NRG Crashes and Rides, DRK-BRT cross-matched Hi-Hats and asymmetrically–vented Thunder and Lightning Crashes— extended drummers’ sound choices and kept the upstart cymbal maker at the forefront of modern drummers and modern drumming. This year, as TRX celebrates its 10th Anniversary, the company continues its commitment to pushing the boundaries of cymbal sound with the launch of the “X” Series. 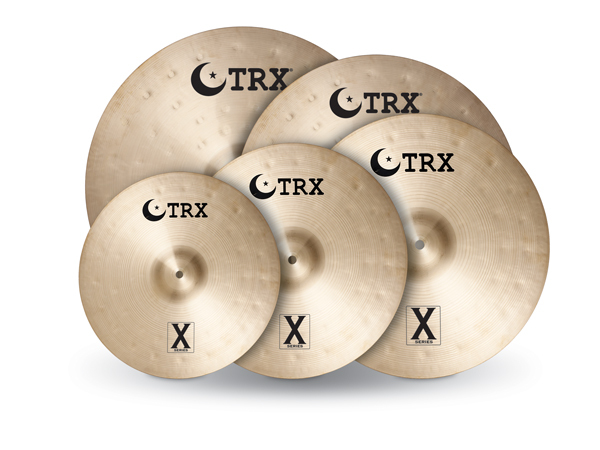 Labeled “X” to both commemorate ten years and describe their exotic sound quality, the TRX “X” Series is thin, traditionally-lathed, hand-hammered, B20 cymbals with a unique pattern of deep, over-hammered dimples. This exclusive design provides an unprecedented combination of warmth and wash with definition and projection and fills a sonic niche virtually untouched by other cymbals. The “X” Series is available in a full selection of Rides, Crashes and Hi-Hats and recommended for a wide variety of contemporary music, especially modern Jazz and classic Rock as well as R&B, Latin and Pop.